This version colored in EQ with the actual fabrics I'll be using for my version. Join me for another Justquiltin Day! 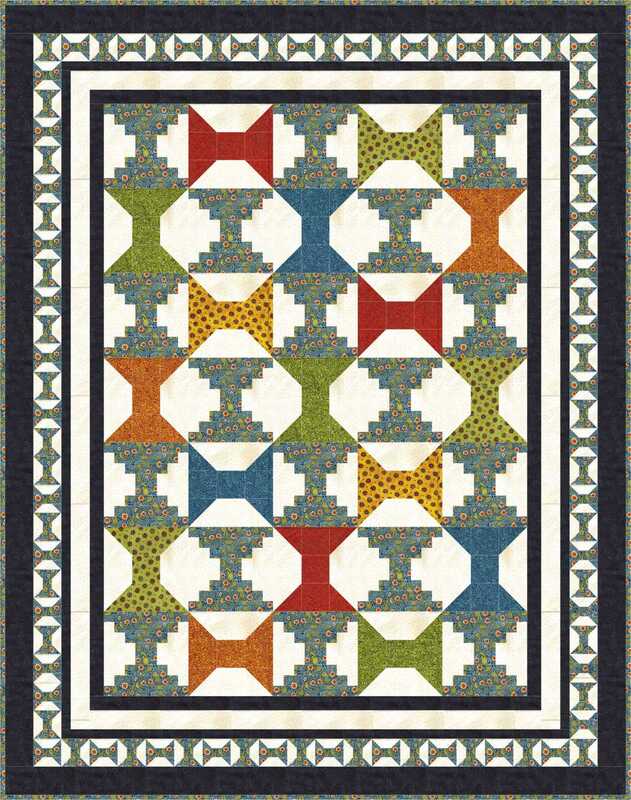 March 20 is National Quilting Day and what could be more appropriate than to spend the day quilting. I hope you’ll join in on stitching Stacked Spools. Here’s two other colored versions of stacked spools below – one with a limited number of fabrics and the other more scrappy. I like the log cabin spools mixed with the regular spools – really easy sewing and cutting. I don’t know who colored in that pastel version since those who know me know I don’t do pastels or ditzy little florals 🙂 I must have been trying to stretch my color choices the day that one was originally colored. 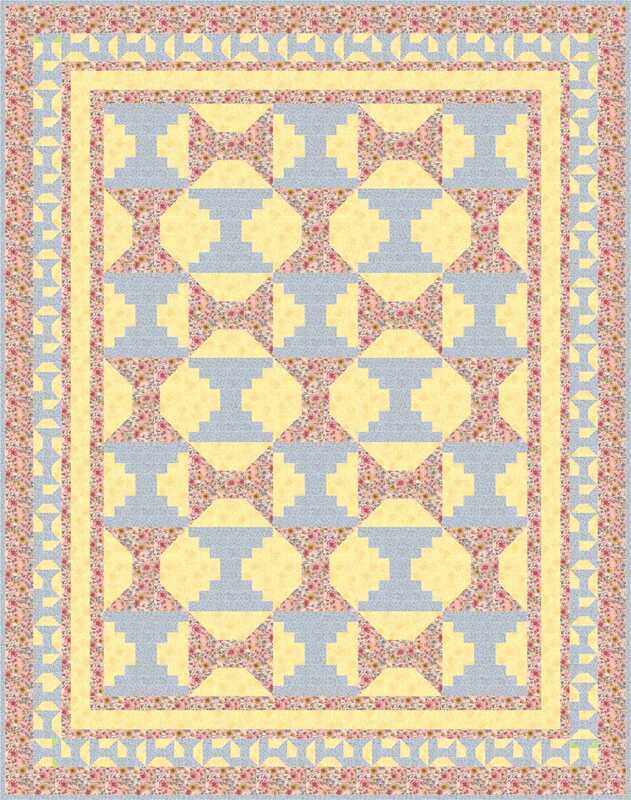 This pattern will be provided in a little different format than other patterns I’ve posted to the blog. You will be given the cutting /piecing directions for each different block style and the borders. So there will be a pattern page on how to make/cut ONE complete block for the log cabin style spool, another on how to make/cut ONE block of the alternating spool block, another for ONE of the mini spool border blocks and then the remaining border sections. This is a very scrappy friendly pattern and in this way you can make it as scrappy as you like. You can use all the same background fabric or make those scrappy using for instance many shades/fabrics of white tone on tones, all cream fabrics or whatever your heart desires. If you wish to make all of a particular style of block from the same fabrics, you will need to multiple out how many pieces of each pattern section you need to cut for the number of blocks you are making if you want to cut everything first before sewing. It’s not hard – very simple math – or you can cut and work on one block at a time. In this way you can easily make the quilt as large or small as you like and it saves me lots of time in writing up the pattern – more time for me to come up with new patterns and more time for me to sew myself. I’ve used this method (writing directions for just one block) in many swaps I’ve hosted and the ladies have done very well accomplishing their goal of making multiple blocks and you can do it too! I have listed the yardage estimates – and these are only ESTIMATES – based on what EQ comes up with for 40″ of useable fabric. However, depending on how you cut your fabric may be a little different than how EQ “thinks” you should cut it so bear that in mind. There are separate estimates for version 1 below (which only uses 3 fabrics) and version 2 (which uses more and is more scrappy). 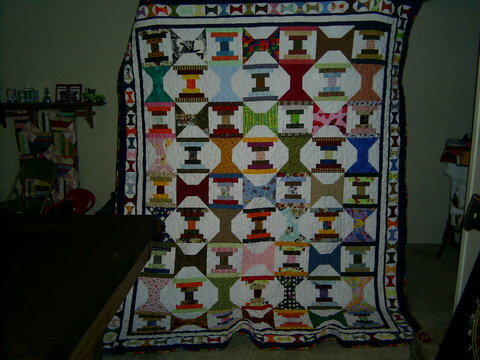 Click on the links below to get the quilt photo and yardage requirements. As with all my patterns made available on my blog – make it, use it, gift it, give it to a charity or sell it – but do not share the pattern in any form. Give the link to this page to anyone who wants the pattern to download their own copy. Be sure to down load it while it is available –whether it will still be here two months from now or a year from now who knows. Once it is taken down it is no longer available – not for sale and not for emailing to individuals. Thank you. If you have any questions that are not answered on this page, please leave a comment with your question and I will reply to it so that they are out there in case someone else has the same question. I hope you enjoy this project. Please share photos. Mister Linky does not care to work for me right now so please post a comment with a link to where you photo is or email a photo under 300 kb in size and I’ll include it here. Here’s one made by Peggy. Her whole family is clamouring to claim it as their own but she says she’s keeping it. 🙂 It’s done in flannels – who wouldn’t want to snuggle under this lovely scrappy version. 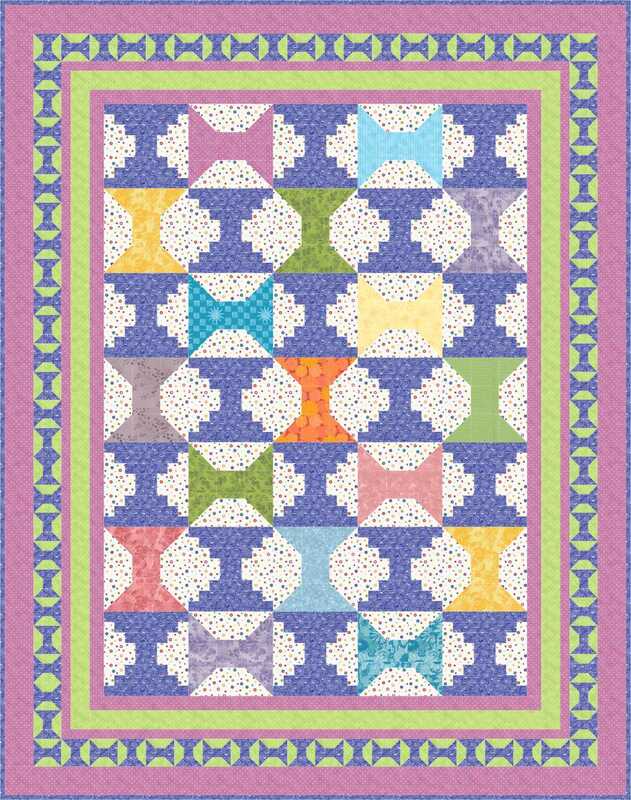 Thanks for another beautiful quilt pattern. I also like bold,bright colors. Everyone says they know my quilts by the colors. Thanks again. Sherri – at some point I accidentally turned the links off. I think they are all back on now so you can try again. I am so glad the instructions are still up!! I went to my quilt guilds retreat today. Took the class “Cathedral Windows” was fun, great class! Yep Linda – it will remain up on the blog. Now to load the final installment and load a photo of what I’ve got done so far. Happy stitching! Thanks Pat. Hope you enjoy it. Fabric is purchased and in the wash! I was going to make it scrappy, but I haven’t done one toned-down for awhile, so went with red/tan/blue and the 3 color version. I will see how fast I can get it done! You’re a speed demon – you’ll have it done in no time! I really like this quilt and can hardly wait to start it. I hope to be able to do this one with everyone, but will get to it by myself later if not. 🙂 You’re so easy to coerce! You know I am going to try and do this!